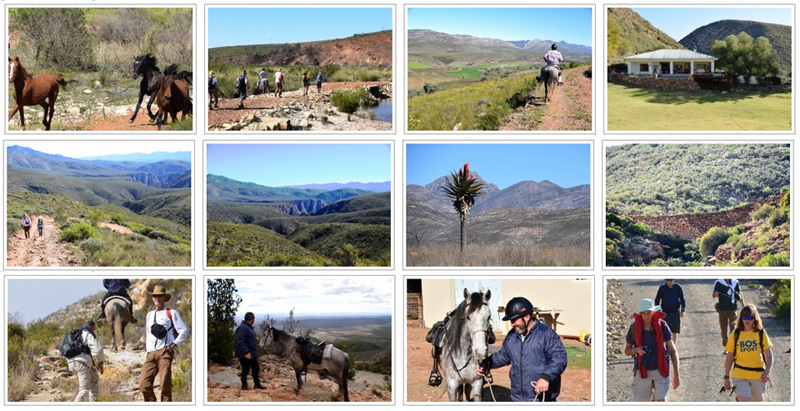 Baviaans Camino | 93km over 4 days on horseback or by foot. Portaged, catered for, 1 support vehicle. Accommodation in old farmhouses. Our own Baviaans Camino. Group size: 14 (of which 6 can be on horseback). 50% deposit will confirm your booking, and the remainder of the deposit is payable 6 weeks prior to your hike. We can also assist with additional accommodation before or after the hike as well as with shuttle transfers. 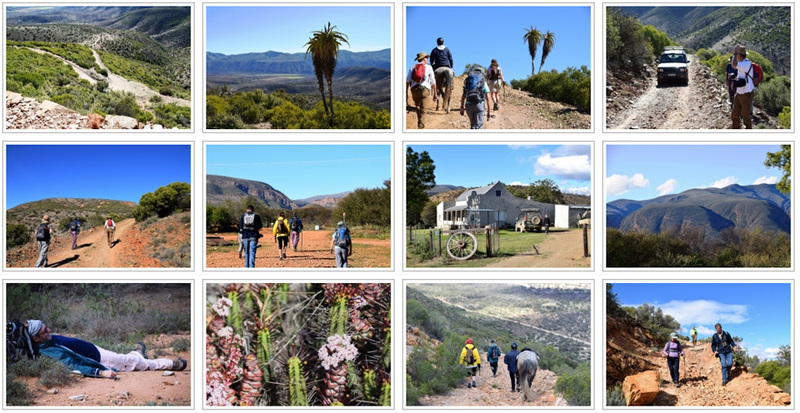 The Baviaans Camino is a journey of 93km (give or take) over 4 days, traversing the Baviaanskloof Mountains and Kouga Mountain Range by foot or on horseback. Hikers and riders meet in the Steytlerville District on arrival day, where we all will stay together in an old farm house. This gives us time to familiarize ourselves with the area, the route, the horses and one another. Route briefing is over dinner. 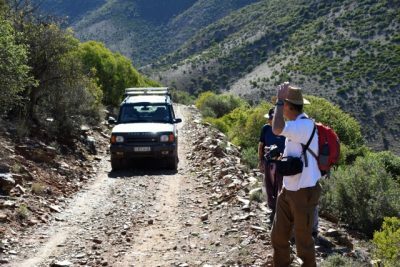 The route starts on the outer edge of the Baviaanskloof Nature Reserve, at the foot of the Baviaanskloof Mountain, in an area known as Nakop. Hikers immediately tackle a climb of almost 4km, with an elevation of 400m, to get to the highest point at the Telkom Tower with an unimpeded view over the Karoo to the north, and the Baviaanskloof to the south. After you have walked through shoulder high fynbos, a 7km rocky road leads down to the main road of the Kloof, and eventually to the overnight point at Doringkloof Farm where you stay in a farm house. On the second day you tackle the southern side of the Baviaanskloof, again with high climbs and long descents, traversing the Kouga Mountain Range. The chance of seeing another human is almost impossible, which gives hikers the chance to become one with nature. 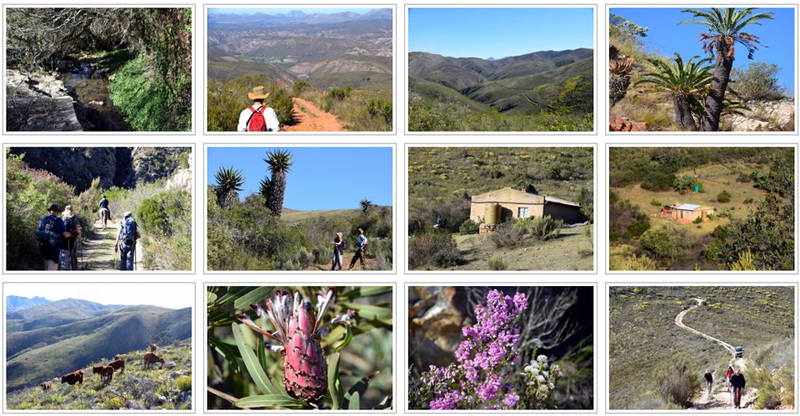 The Baviaanskloof is home to 7 of our 9 biomes, which are clearly visible as you hike – karoo thicket and spekboom, aloes, cycads, fynbos and proteas. Accommodation for this night is the most basic and two rooms with bunk beds. We all will have to assist to make ourselves comfortable.. 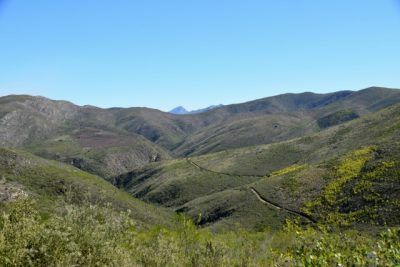 The hike starts on old roads through many kloofs, giving birders ample joy, before another long climb takes you to the top of one of the highest hills of the Kouga mountain range. A long descent takes you to a remote farm, allowing for a soft introduction back into civilization as you stay in a farm house on a working farm. The Moordenaarskloof Mountain Pass gives hikers the last chance to enjoy the spectacular scenery, typical of the Baviaans. A descent leads to the Kouga River, where the welcome tranquil waters await and time can be spent swimming (weather and time permitting). What comes down must go up – from here you continue on the road towards Kareedouw, but will venture off, using the old Mail Trail to the outskirts of the town (which includes three last climbs). kayaking. Accommodation is in self catering units at Nguniland. We stay in old and very basic farm houses, with only shared accommodation available. You will need a sleeping bag for two of the nights. All food and lunch packs are provided, and hikers will be required to assist with making fire etc from time to time. You will have to carry a lunch pack and enough water during the day. The 93km route is split over 4 days, between suitable overnight points. Everything we need for the four days must be taken into the area, hence the need of a support vehicle. Communication in the Baviaans Wilderness is basically non-existent (and absolute bliss) with extremely limited cell phone reception. We have a satellite phone for emergencies. We transport your luggage, plus firewood, water, food, tents, sleeping bags and more. These are all the elements we need to really “get away from it all” for a few days, but adds to the costs. You will also be accompanied by Hercules and Anieka on horseback, with Eric and one more person in the vehicle. In order to make it as cost effective as possible we require a group size of 14. Kindly contact us for the current rates and a fact sheet. Baviaans Camino and the Chokka Trail, and you have an amazing hiking holiday of 137km over 10 days (arrival and depature dates included). We have set dates between April and September, and group sizes are limited to 14 people, of which 6 can be on horseback for the Baviaans Camino leg. To enjoy the beauty of nature on horseback is an unforgettable experience. You get to see places inaccessible to motor vehicles (and too far for hikers!) and being outdoors on a beautiful horse makes you part of the whole ambiance. Join Hercules on one of his legendary Baviaans Rides. The Real Thing takes you from the blue waters of the Tsitsikamma over mountain ranges and through rivers into the famous Baviaanskloof, through the beautiful Karoo and Grootriver Canyon. A unique way to experience 7 biomes in 7 days. 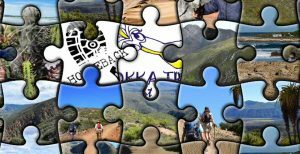 For those who think 7 days are too long, find out about the Int(r)o the Baviaans, the Bo-Kloof Cloverleaf, the Exit(ed) Baviaans or the Baviaans Adrenaline in September. Hercules also offers outrides (1 – 3 hours) tailored to your needs without restriction of age or level of experience in the Tsitsikamma Mountains or on the beach. 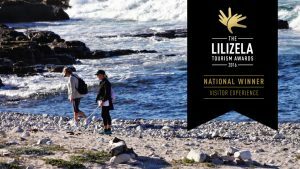 Best Visitor Experience in South Africa – Lilizela National Winners for 2016, 2017 & 2018!! The Chokka Trail is a 62km hike over 4 days and 3 nights in the greater St Francis area. You will enjoy picturesque fishing villages, a rugged coastline, sand dunes as far as the eye can see, a tidal river, protected fynbos, wetlands and a visit to South Africa’s only privately owned working harbour. It is a slackpack hiking holiday between Oyster Bay, St Francis Bay and Cape St Francis with accommodation in top class guest houses and a Resort. The best possible way to see and experience just how beautiful the greater St Francis is – on foot, at your own pace and with a hot shower, warm meal and cold beer waiting for you at the end of each long day. The trail is situated in the Kouga Region, Eastern Province, south of the Baviaans and a mere hour’s drive to the west of Port Elizabeth. If you still want to carry your own pack and rough it a bit, and you can read a map, the Chokka Trail (unguided & self supported) options are for you. Just to say thank you for booking us yet another lovely place to stay for the last night. We’ve so enjoyed everything you and Eric arranged for us and the walking was superb. We loved spending time with you both – and our 4 fellow walkers who were great company too. We wish you all the very best with the Chokka Trail and hope maybe one day to meet again.